We all get that happy little feeling from getting a good deal on a purchase. I take that a step further though where I feel like I've won. It's like a game- find the biggest sales! Because of my competitive nature, I've bought quite a bit I don't need just because of the big savings. Take these shoes, for example. Do I really need a new pair of sandals? Absolutely not. But could I walk away from a pair of shoes that was 93% off from about 100 bucks? No freaking way. Do you hear me? 93% off! Geez, even if I wear them once, I still win. Big time. Thanks so much too all who participated. And keep an eye on my blog because I've got more giveaways lined up soon! Seriously. I have that same addiction! I can't ever say no to something on sale!! That is an amazing deal! I always have to buy things when they have amazing deals like that. It's impossible to pass up! 93% off?! That is insane! If you passed that deal up you'd be crazy! : ) They're super cute and will match everything! Love the skirt as well. Very cute outfit! That skirt is something else. Love the colour combination also. Thanks for posting the photos and feel free to drop by me too anytime. If apparels in the store were 93% off I'd totally grab everything off the shelves! And by the way you're looking very gorgeous; love the shades! That's a very loo darlin, love it! Thank you very much for your compliment on my hair. Love your hair too! Your sandals are so pretty and look great with your outfit! They seem to be very comfortable too. I followed your blog, I hope you will do the same? Great outfit! Your hair is amazing! you are totally gorgeous! love these pics! You're so chic! 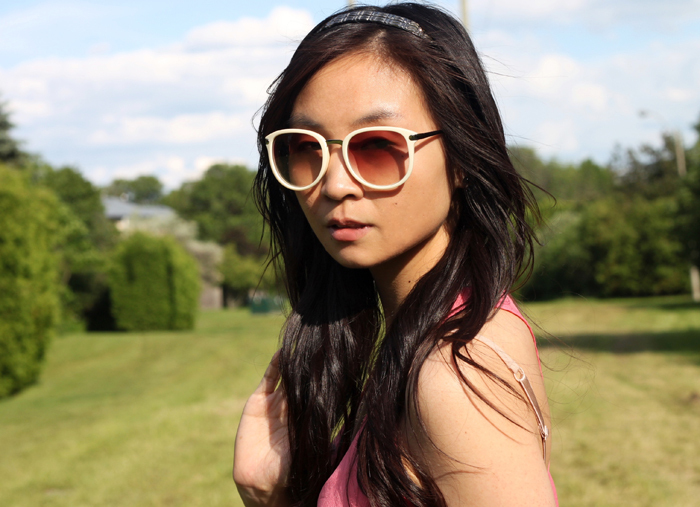 Loving your wavy hair and glam sunglasses. And 93% off?! Dang girl! Who could pass that up? Don't you just love finding a good deal? i'm digging the white frames on those sunglasses! what a cute summer outfit! i love that skirt! Love that denim skirt. So retro. super cool summer look! :D you look gorgeous Sabrina! Hey! Love your look! And thank you for commenting!